“He who makes a beast of himself gets rid of the pain of being a man,” declared Dr. Thompson – and true or not, you’d be mistaken in moving past the idea too quickly. Which brings us to Weird Owl. “Build Your Beast A Fire” is the recently released album by Weird Owl, and even without the band having a doctor in the bunch, it succeeds spectacularly in administrating its own peculiar medicine. It’s a perspective apart from that quoted above, but one that we’ve also found quite impossible to move past too quickly. Not that we want to. From the opening intergalactic-busking of “No Time Nor No Space” to the repeating, retreating, revolving refrain that gives the album its title, it’s an incredibly welcoming piece of art, especially if you find songs and saucer-shaped shadows that leap pyramids in a single sound welcoming. And we do. More than that, it constructs its reality so completely that you’ll want to stay awhile, and maybe return shortly thereafter to see if you hear what you thought you saw. We believed it when time declared it good to warm our bones beside the fire – and we believe Weird Owl have built a bright, bold fire of their own. Sit beside the fire with vocalist/bassist Trevor Tyrrell, who was kind enough to battle the beast of our burdensome queries below. One of the many things that makes “Build Your Beast A Fire” such a compelling listening experience is the very real sense on behalf of the listener that Weird Owl is taking us on a journey, possibly from Point A to Point B, but just as likely to Point C, D and E as well – for lack of a better term, we’ll say the album has a “flow.” Do you see the songs collected here as being part of a larger whole, of a story arc, of a bit of “destination listening”? How much forethought went in to the sequencing of the tracks on “Beast”? What are some other albums or artists that you admire for their ability to construct a singular journey from such disparate elements? We definitely constructed the album intentionally to create a sense of growth or movement from one moment, or song, to the next. Thematically, it was very important to suggest that the album represent a process. Just think about the album’s title. It is an exhortation to engage in an action, not a statement that is a reinforcement of passivity. You, the listener, are being asked to join an ongoing rite or act. It is our hope that the listener not feel the same at the end or the record as he/she did when the album began, nor should your environment be unchanged. And that is a very basic definition of Magic. Looking back now, in what ways would you characterize your approach to the creation of “Build” as different to its predecessor, “Ever the Silver Cord Be Loosed,” if at all? Sonically speaking, was there something different you were trying to capture in the sound of “Beast”? It’s a very sharp and shiny sound – though not necessarily polished and still cast from the fringes. How close does the album come to capturing the sounds in your head? The creation of the two records were quite different. We had very little time or resources to complete ETSCBL. The songs were not written as a cohesive unit conceptually, so in my opinion, that record has wildly different things going on from song to song. But in that way, it is a perfect document of where we were as a band at the moment of the album’s creation. With BYBAF, we had a more exact approach: songs were written for the album specifically, the lyrics were all penned with a definite framework in mind, and most importantly – we had a lot more time and space to see things to their intended fruition. As far as the differences in sound, I would chalk that up to using different engineers in different studios for the two records. I am still searching for the exact sounds I can hear internally to be made real in the physical realm. I am not even sure the instruments exist yet. Can you speak a bit about the titular inspiration for the album? We automatically tied the album to the Jungian concept of the “shadow” – or the “part of the unconscious mind consisting of repressed weaknesses, shortcomings, and instincts.” In 1938’s “Psychology and Religion,” Jung himself (a huge Hawkwind fan, by the way) described the shadow this way: “Everyone carries a shadow and the less it is embodied in the individual’s conscious life, the blacker and denser it is.” Is it fair to view “Build Your Beast A Fire” as one attempt at lessening the density of blackness of this shadow, or beast? Alternately, can it refer to the practice of heating 12 oz. cans of Milwaukee’s Best over an open flame? You’ve pretty much hit the proverbial nail on the head with this one; I have been fascinated by the psychological alchemy of Jung for sometime, and the theme of the album is consequently influenced. There is no simpler and more universal glyph for advancement than bringing light to the dark. A lot of times, this ends up being expressed as some loving rainbow circling over blissed-out yoga practitioners, but I find myself more intrigued by some of the darker methods. Hence the invocation of the Beast. There’s got to be balance, though, in all things. Otherwise, we’d be a black metal band. As far as the beer-in-the-fire interpretation, I can see some alchemical significance to that, too. It’s all metaphor, brother. Similarly, what’s behind the origin of the Weird Owl name? In Roman times, the hoot of an owl was said to be the sound that preceded imminent death. To an Apache Indian, dreaming of an owl signified approaching death, while in the Americas, the owl is commonly associated with wisdom and knowing how to get to the center of a Tootsie Pop. What does it mean to you? A nocturnal hunter, guided by sound. While others sleep, the owl is active, procuring prey and dispensing harbingers, mysteriously braiding them with the newly-born pink rays of the sunrise, before disappearing to lands unknown. What does your own personal musical evolution look like at this point? What where the albums or artists that served as signposts for you of continued musical discovery? Was being in a band something you always wanted to do? Being a musician was something that just made sense to me ever since I was a teenager. I grew up as a child listening to pretty standard 60’s/70’s stuff, and my Mom bought me an acoustic guitar when I was 16. It seemed so obvious: why should I only listen to music when I can make it? My listening has been all over the map since then: everything gets a turn through the auditory machinery. I tend to be less a completist as other musicians I know – I have huge gaps in knowledge around certain genres or times, which can be awkward conversationally – but I tend to be more internally-focused on my own music anyhow. What music have you been listening to lately? If push comes to shove, what is your favorite “Weird” Al Yankovich song? I’ve been dropping the needle on Lumerians “Transmalinnia” a ton lately. I love it. Also, I have a daughter who is almost 7, so she and I have been getting into early (pre-Magical Mystery Tour) Beatles. It is some of the most perfectly constructed rock/pop music ever. Sic Alps “Napa Asylum” has been in pretty heavy rotation this whole year as well. Best “Weird” Al Yankovic song ever: it is a tough one, but I’d have to say “Fat”, only because I did a lip-synch performance to it for my 4th Grade talent show. 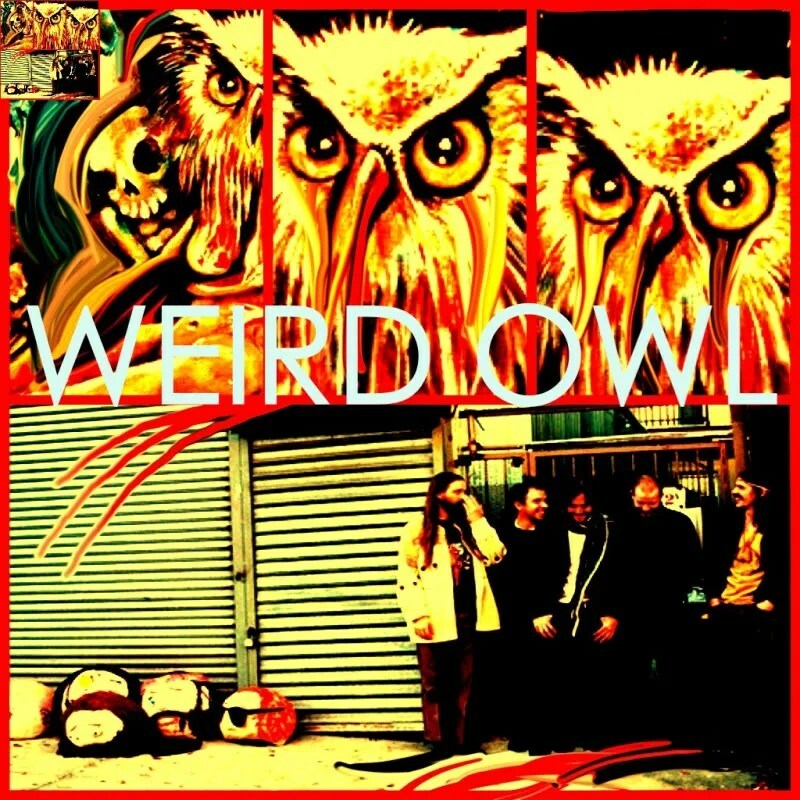 How do you think being a band from Brooklyn impacts Weird Owl, both from your own perspective and that which you’ve encountered from listeners? Do you find yourself somehow having to convince certain audiences that it’s completely appropriate to create psychedelic music in a borough of NYC? The notion that psychedelic music can only be created under certain environments or locales strikes us as absurd, but what do we know? We often encounter this question because it does seem somewhat of a mismatch between musical and physical environment. I never feel as if we need to convince anyone of anything. Our music is our music, take it or leave it. If you happen to be someone that thinks all music from New York City needs to be flashy, aggressive, slick, etc., then great – you have literally thousands of bands to choose from. Think about it this way: Manhattan is a giant grid, pulsing with overwhelming electrical intensity pretty much unceasingly. Folks are used to traveling quickly and repeatedly in this grid pattern, conditioned to get a reward (i.e. a paycheck) after a certain number of grids completed. Unfortunately, one consequence of this is that it sometimes leads people to act quite selfishly, as they assume prime importance over others rather than seeing themselves as linked as part of a larger organism. It’s easy to see why certain musical styles reflect this paradigm better than others. My opinion is that psychedelic music is by and large a reflection of an interior state or process. It can therefore be made anywhere by anyone who has engaged/does engage on this sort of interior/astral realm. It is not dependent on the survival grid mentioned above, so it tends to be associated with more pastoral settings, or canyons, etc. Anywhere natural and free of artificial restrictions. Our music is a more akin to a long and eroding wind than it is to a burp on a subway car. Would you care to comment on the rumor (the rumor that we are attempting to start right now) that Weird Owl and Barn Owl are collaborating on a split 12” picture-disc EP that pays tribute to one of the hottest R&B singers of the late 80’s, to be entitled “Owl B. Sure”? My lawyer says I cannot. At this time, all I am prepared to say is that our cover of “See You Later Owligator” will be released telepathically before the masters are jettisoned into space. The gift of language is what separates humans from lower primates, but it is also one of our biggest curses. The meal is not the menu, but many among us live as if we are full without having eaten. What’s next for Weird Owl? We have been kicking around plans for a European tour in 2012, maybe also an East Coast tour early next year. Both should be amazing. We are also beginning to place the framework (or perhaps more fittingly, demolish the framework) for a new EP. Up to now, I think of us having served as narrators of an altered reality – a psychedelic Lewis and Clark, if you will – but now I have become more interested in actually facilitating a neurological change in our listeners through our music. I want us to create the last great musical rite of the human experiment. But don’t think of it as some sort of new age mumbo-jumbo; we’re the apes climbing up the bomb.